Established in 1919, UNC Kenan-Flagler Business School is home to more than 2,700 students in its undergraduate business, MBA, EMBA, MAC and PhD programs and 5,500 executives in non-degree programs. It has 121 full-time faculty from 20 countries in seven academic departments. Kelsey Furr, assistant director of donor relations, needed 1,000 folders for UNC Kenan-Flagler Business School’s annual endowment reports. These reports would be sent to the school’s donors. “I picked Company Folders because you had such a great range of options for folder designs and paper stocks,” Furr said. With more than 150 presentation folders from which to choose, Furr selected a one-of-a-kind folder-a 9″ x 12″ center pocket gatefold presentation folder-because of its visual uniqueness. Furr’s design opens from the middle, straight through the center of the school’s logo-a campus landmark. 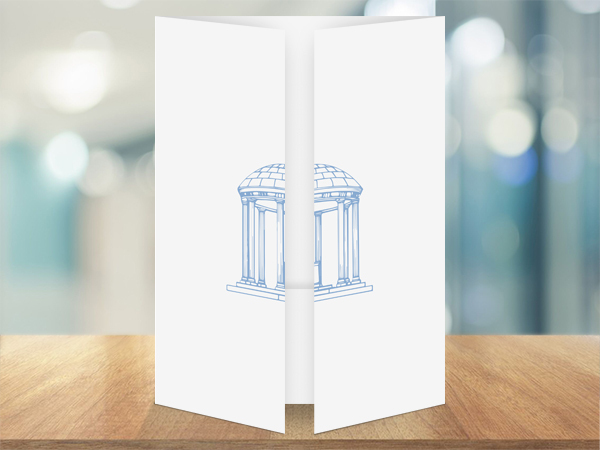 The cover is cut into two narrow panels that open like a gate (reminiscent of entering the school itself), exposing the endowment reports in the center pocket. Furr said, “I like the heavier stock options you all provide,” after selecting our 16-point C2S white semi-gloss stock, which is thicker and more durable than the standard 12-point. The quote, order, and design process was quick and easy for Furr because she had a finalized vector file of her artwork ready and responded quickly. She started by requesting a quote and submitting artwork for review – which was processed in about 30 minutes. Next, she submitted her order, and 10 minutes later, received a proof. The key for such a quick turnaround is making our processes simple for our clients to do. With our wide variety of folder products and options, more than 10 million combinations are possible; however, our website product configurator allows clients to select the options best for them in minutes. Furr’s order was sent to production less than three hours from the time she requested a quote because of our fast response times, easy process and constant communication. As is customary with each order, email updates were sent to Furr each time her product status changed, including when her order was received, when her payment was processed, and at every other stage of the process. “Someone from Company Folders communicated with me at every step of the process, and I got a call confirming the order, too,” she said. As a result of Company Folders response times, making processes easy for customers and constant communication, her order was sent to production less than three hours from the time she requested a quote. To top it off, her order shipped five days earlier than expected. In terms of the overall process, Furr said she wouldn’t change a thing and plans to use Company Folders again. “The customer service has been prompt, hands-on and friendly,” she said.